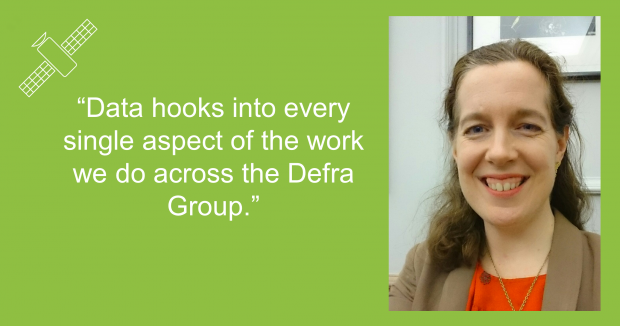 I’m Emily Miles and along with joining Defra in November as the Group Director of Strategy, I’ve just become the Senior Responsible Officer for the Defra Data Programme. If information sits in silos and is not discoverable or available - but could really help you do your job better or faster - that's a waste of your time. The Defra group has stacks of data that we're just not using as well as we could to inform how we can protect the environment better, or better distribute funds. The people that go to different parts of Defra for a licence, or a grant, or a consent, or a permit, could have a more seamless service than they do. There are loads of businesses out there who could be much more creative with our data than we are - and that might unleash more innovation and growth in the economy. Data hooks into every single aspect of the work we do across the Defra Group. If you're a policy official, or a corporate services person, or an ops person - data is relevant and important to you. You don't need to be a provider of data to care - just a customer of it. And the better informed a customer you are, the better Defra makes use of its data. Currently the data programme is very focussed on delivering 8000 new open datasets by June. This data will be available to anyone to reuse free of charge. And by the time Defra is done releasing this data, it will have released around one-third of the open data available through data.gov.uk. Our most notable release so far has been Environment Agency’s LIDAR which shows the detailed height of 72% of England. The Environment Agency collected LIDAR data to help with flood risk management, but other people are using LIDAR to do all kinds of fantastic things; from calculating building heights, to improving environmental reports to teaching children about archaeology hidden by woodland and discovering lost roman Roads. This innovation will only grow now our LIDAR data is free to reuse and easy to download. But it’s not just LIDAR... we’ve also released noise mapping data, made air quality data available in bulk for the first time and JNCC, Natural England, and Cefas have released a huge amount of data about the marine environment. Our Data Programme won’t end in June, this was always the accelerator period, designed to kick-start change. We are now beginning to look at the other aspects of becoming a data driven organisation, the data programme team set this out to Defra group staff in a recent post on this blog. Tweet about Defra data. We have also established the #OpenDefra campaign because becoming open is not just about publishing more data it is about changing the ways we behave and the behaviors of our stakeholders. Surf our data – especially if you ARE a techie - and think you could build apps, improve databases, or draw out new insights from Defra data. You can find the full listing of what’s available and comment on our data on DATA.GOV.UK. Keep in touch with the Defra Data Programme or let me know what you're doing with our data. Get in touch via Twitter (@OpenDefra or #OpenDefra) or email the team. I agree with the massive opportunity here. Making better use of the data held in Defra and wider Government can and will make us more efficient and can also offer opportunities to the general public.